St. Joan of Arc is located in the Village of Nashotah, Wisconsin, nestled between the cities of Delafield, Oconomowoc and the Village of Okauchee. The first bell rings at 7:35 with classes beginning at 7:40. On the first day of each week, we hold our prayer together in the entry space of the school at 7:35. Full school days end at 2:45. Early release days and half-day junior kindergarten end at 11:35 a.m.
St. Joan of Arc serves families from Nashotah, Delafield, Hartland, Oconomowoc, Okauchee, Merton, Pewaukee and Wales. Local county's do provide busing to the school. Contact your local public school district for information regarding busing or parent contracts. 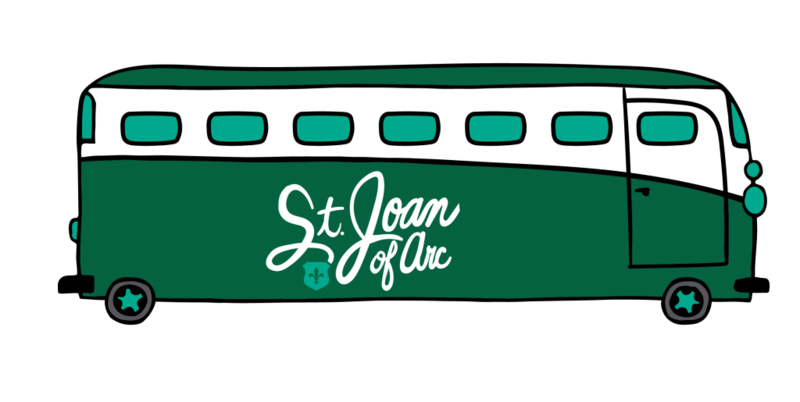 St. Joan of Arc has partnered with 4 Pea's for our school lunch during the 2017-18 school year. Do you offer before/after school care? Children may be dropped off each day as early as 7 a.m. After school care is available for an extra fee following school until 6 p.m. each day that school is in session. What kinds of extra-curricular activities do you offer?